Efforts to strengthen national child protection systems have frequently taken a top-down approach of imposing formal, government-managed services. 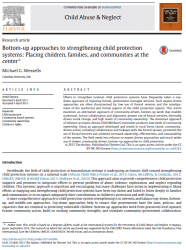 Such expert-driven approaches are often characterized by low use of formal services and the misalignment of the nonformal and formal aspects of the child protection system. This article, published in Child Abuse and Neglect, examines an alternative approach of community-driven, bottom-up work that enables nonformal–formal collaboration and alignment, greater use of formal services, internally driven social change, and high levels of community ownership. The dominant approach of reliance on expert-driven Child Welfare Committees produces low levels of community ownership. Using an approach developed and tested in rural Sierra Leone, community-driven action, including collaboration and linkages with the formal system, promoted the use of formal services and achieved increased ownership, effectiveness, and sustainability of the system. The field needs less reliance on expert-driven approaches and much wider use of slower, community-driven, bottom-up approaches to child protection. Read the full article by CPC faculty affiliate, Michael Wessells, here.